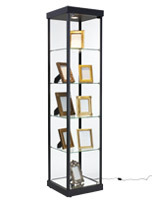 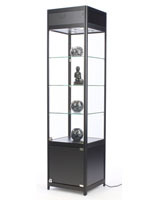 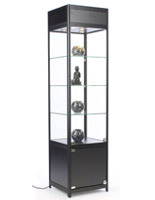 There are so many attractive and affordable display cases in this category that it may be pretty hard to choose between them. 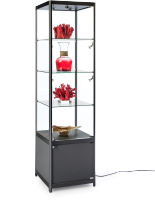 While the styles may differ, there are some standard color in all of them, like black and silver, and some common finishes too, like maple and cherry. 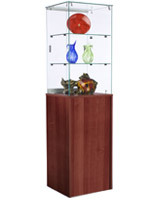 Rosewood and oak are stains that are also available in certain display case options. 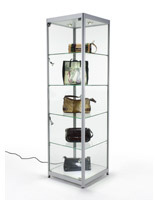 Many of the curios include halogen lighting of some sort, whether it is just in the top of the display or track lights down the sides. 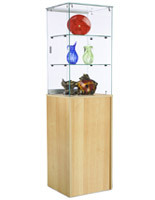 Tempered glass panels and shelves are the standard with a few acrylic models. 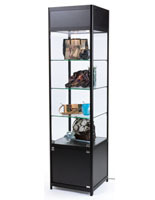 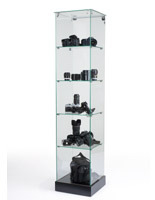 Tempered glass is safer than regular glass so that these cabinets can be used in busy retail settings. 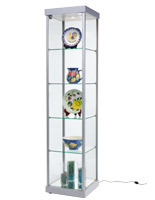 The majority of the curios is square and measure between 18” or 20” in their width and depth. 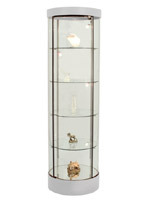 There are several round models that feature a 22” diameter. 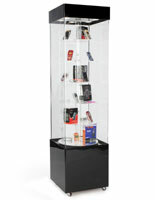 The height of the display cases is between 72” and 77” tall in order to place important items at good viewing heights for consumers. Many of the curios are full vision models, but some are propped up with on laminated bases that may also have room for storing gift boxes or cleaning supplies. 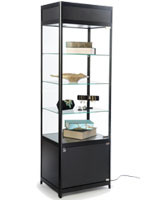 All of the tempered glass and melamine cabinets lock tight to keep the valuables that are stored inside of them safe. 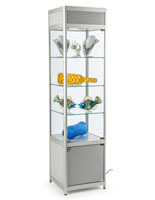 A few models include feet levelers built into the bottom of the base so that they can be used on uneven floor and still provide stability. 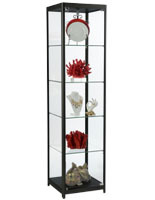 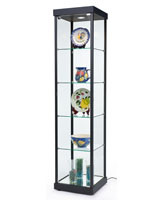 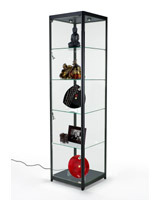 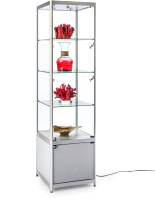 Adjustable shelving in the units allow for items of different heights to be displayed inside for the ability to showcase an entire lines of items no matter their size. 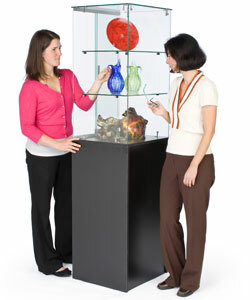 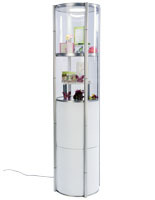 Many of display cases require some assembly with the majority of it being done in house to save consumers time. 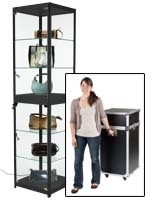 Other models are shipped to customers unassembled to save on freight cost. 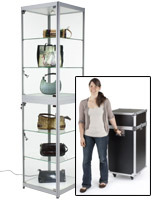 Assembly instructions are included and sometimes videos are also provided on individual item pages. 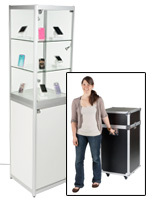 There are also a few models that include travel cases, making them great selections for use by vendors at trade shows or crafters at fairs and artisan events. 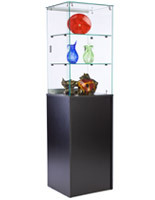 All of these designs are compact by their nature and are great additions to showrooms of any size, especially those with limited floor space!